Do you have a Hotel that you would like to list on this page? Mondial Hotel harmoniously combines the exceptionally modern facilities with the elegance and luxury of the neoclassical design, creating a unique cosmopolitan atmosphere. Eperience City Hotel Tirana, a high standard hotel, offering exquisite servExperience City Hotel Tirana, a high standard hotel, offering exquisite service, located in the very excellent and confidential heart of Tirana. ice, located in the very excellent and confidential heart of Tirana. Diplomat is the place where style, emotions, creativity and perfection meets a world of beauty and hospitality. As the name itself suggests, it was build with the intention of bringing to Tirana the chic characteristics of hotels found in the so called fashion capitals of the world: New York, Milan & Paris. 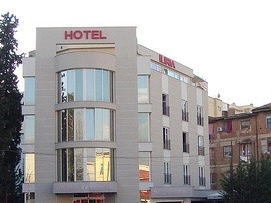 Iliria Hotel is located in a stylish area of Tirana, close to the city's beautiful Natural Park, this hotel is designed to make your stay enjoyable from the moment you arrive. Being only walking distance from the Embassies of the: United States, Holland, Rumania, Switzerland, Russia, Macedonia and Italy it is almost perfect for those who come to work in of these establishments. Located near center of Tirana gives you the possibility to explore without venturing too far. we’re also in easy reach of the city’s many embassies and businesses. Baron Hotel is in the middle of Albania and is in an area characterized by a harmony with nature just 5 km outside the center of Tirana. Hotel has 4 floors and has 20 rooms. A warm and friendly welcome awaits you at Xheko Imperial known as Hotel President located in a quite corner of the very trendy area of Tirana known as “The Blloku”. Xheko Imperial offers high western standards combined with Albanian traditions and hospitality.